The farmyard humor in The Unbelievable Top Secret Diary of Pig by Emer Stamp made me laugh out loud the way that watching any episode of Shuan the Sheep does and the potty humor made me laugh out loud the way any kind of fart in general does. While I am definitely embarrassed to admit that farts and fart jokes still crack me up, I think that I am not alone in this. I also think that there is a right way and a wrong way to employ (deploy?) fart humor and, among many other fantastic things, Emer Stamp uses her fart humor in just the right way in her debut novel, The Unbelievable Top Secret Diary of Pig. When Pig finds a "little book and a chewed old pen" in the garbage heap, he begins keeping a diary, written in Pig and the smelly story begins! 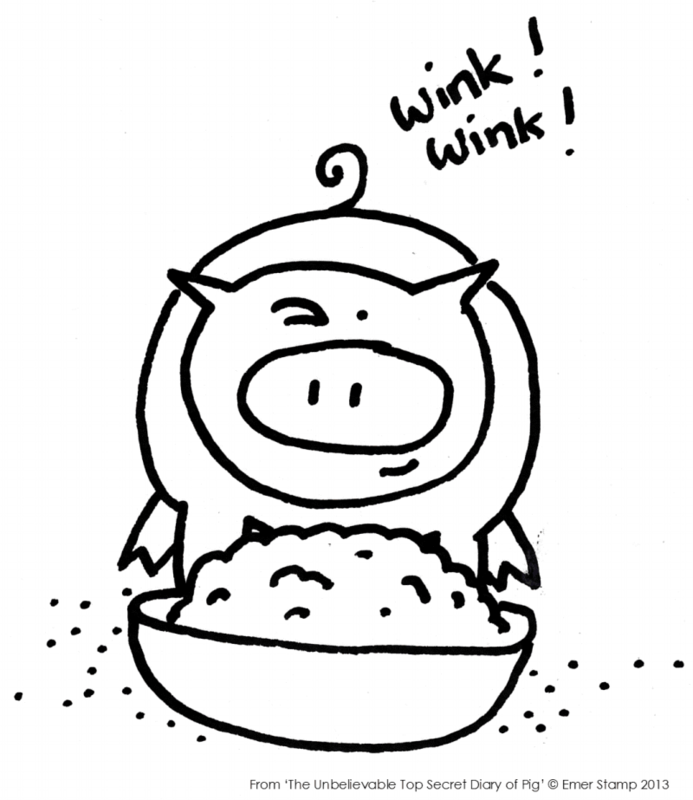 One aspect of The Unbelievable Top Secret Diary of Pig that, like laughing at fart jokes, is a bit embarrassing for me to admit I find funny, is the faux bad grammar that is a result of Pig writing in Pig language. It's comparable to the LOLcats/I Can Has Cheezeburger internet phenomena, if that means anything to you. If it doesn't, don't worry, young readers will not be ruined by exposure to Pig. Pig uses a handful of incorrect verb tenses, adds an "s" in the wrong place and spells words wrong on occasion. His best friend on the farm is Duck, who, like Pig, is also an orphan. Pig's nemeses are the EVIL CHICKENS, lead by the SUPER EVIL CHICKEN. Why are they so evil? They have nasty, evil little eyes that are black, "like little dark holes that is made of pure evil" and they steal Pig's slop and peck him on the head when Pig shouts at them to stop. They also steal Duck's special food and hop one cow's back when she lies down to sleep and poop all over her. In retaliation, Pig regularly backs up to the door of the chicken house and lays some "big fat farts" right next to it. Besides being used as a weapon, farts and manure are used as fuel in The Unbelievable Top Secret Diary of Pig. Turns out the chickens aren't only evil, they are competitive evil geniuses and are building a "trocket." A trocket is a tractor-rocket combo and the chickens across the valley built one and sent it to Mars. As The Unbelievable Top Secret Diary of Pig unfolds, happy-go-lucky Pig, who likes nothing more than slops and scratches on the back from Farmer and spending time with his pal Duck, discovers two horrors. How Pig deals with this and the choices he makes are hilarious, but basically everything about The Unbelievable Top Secret Diary of Pig is hilarious and I found myself reading many passages out loud to my family over breakfast. But Stamp's humor is more than fart (and poop) jokes. When the EVIL CHICKENS approach Pig to pilot their trocket, Pig notes that they speak Pig "very slowly and very loudly with a silly posh-sounding accent" that makes him want to giggle. My favorite part of The Unbelievable Top Secret Diary of Pig comes when Pig is given a taste of Cow's milk by Farmer. It is so delicious he says, "if I could milk Cow myself, I would be in heaven. In fact, even betters, I would be a cow and then I would be able to milk myself all day long. Only I would have to be a cow with very bendy lags, so as they could bend around and touch my udders." Stamp grew up on a farm in Devon, England and her first ambition was to be a vet, although she couldn't score good enough grades in biology. Next, she pursued a degree in designing record covers - just as records were giving way to CDs. While she ended up with a career in advertising, I think that her writing debut reflects both her interest in animals and graphic design. While the book design itself is by Ellen Duda, Stamp's illustrations are perfectly matched to the personality of Pig, the narrator/star/diary author and add so much to the book and make for a really excellent website, The Top-Secret Website of Pig where there are some great activities, including the challenge of translating Pig. Be sure to check out the book trailer and farm visit with Emer Stamp below!